With a view on to the Plombières nature reserve, this holiday home has everything for those who enjoy nature and going on walks! 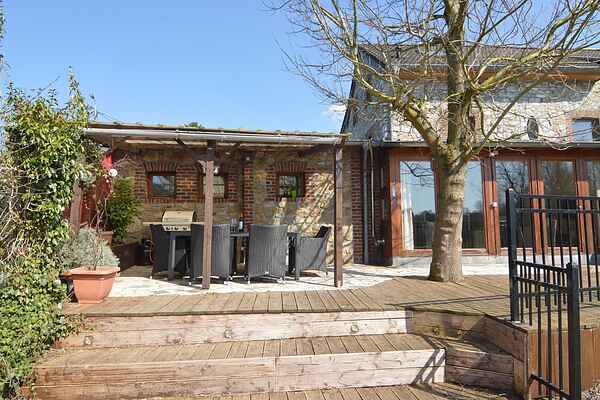 Located on a small, dead-end street with only a few houses in the vicinity, this holiday home enjoys countless assets. It features an immaculate interior and all necessities for your holiday, including: articles for your baby's comfort, children's games in French and Dutch, a Raclette, gas barbecue, a place for your bikes and a hose for cleaning your bikes. The house is adorned with a partially covered terrace so you can enjoy the great outdoors as often as possible. The Plombières nature reserve spreads out at the foot of the house and you can go for a stroll or bike ride from the garden. Maintained trails allow you to traverse the countryside and orchards and reach the beautiful village of Aubel and Herve or, in the opposite direction, Germany and the town of Aix-la-Chapelle. The owners are more than happy to welcome you and provide you with suggestions. If you like, they offer several services (at additional cost) such as preparing a meal for your arrival or preparing a basket of speciality produce.